We deemed today Small Project Sunday, and we rocked it! It started out slow, actually. We needed to find a rug for the new bedroom (which, I am aware, is not a Small Project), so headed out to Dock 86. We didn't find anything there, so headed to Home Goods, which I had almost forgotten about — I won't make that slip again! We found the perfect rug right away, and then coveted lots of other things while Beatrix admired every over-the-top sparkly Easter item in the store. So yes, we all enjoyed it! But during Beatrix's nap, we hit our stride. 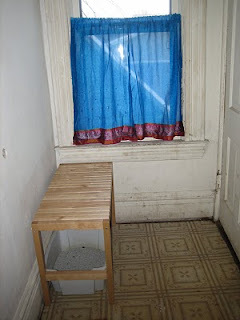 We finished an Ikea hack to cover up the litter boxes, and with that, the corner that usually looked so disgusting already looked so much better that I decided to whip up a quick set of curtains for the window. It's so nice to have a sewing machine set up so that I can do that! We went to Rock the Cradle this weekend, with which I have a love/hate relationship. I love the energy and So.Many.Kids out doing art — but man, it's a crazy, exhausting zoo! Beatrix enjoyed the disco, the instrument petting zoo, and the storytelling, but her favorite part was just looking at all the exhibits at the museum. made me realize we should be spending more time going to museums and such. Our weekend free time is usually packed with such enriching cultural activities as trips to Target, running errands, and the occasional brunch for fun. We really need to make a concerted effort to go to museums, storytimes, and such. Want to join us? I've been asked for some more details about the bedroom. Here is is with an actual bed and such in it. It was very cozy to sleep in last night! Here's a detail shot of the whitewashed book pages above the chair rail. I'm pretty happy with it, if I do say so myself. In other domestic news, we had a snow day today. I managed to muscle through a lot of work that I just had not had time to deal with, plus laundry and posting things on Craig's Lost (need a changing table, a computer desk, an activity table, crib sheets, a piano, or boots? I'm your girl). I also baked a cake, but in less successful news, have discovered I am as genetically unable to cook dried beans as I am in making fudge. Hours of cooking, followed the recipe exactly, and still crunchy and gross. I give up! We've always wanted to have our bedroom in the front room of the 2F. It takes up the whole width of the house (actually 2 open connecting rooms), looking out onto Ashland and Dale. But, in the house's previous life as a rooming house, it had been a greasy kitchen area, and it was in really rough shape. Our vision for the room actually came from a tea tin I got Patrick when we were first dating. 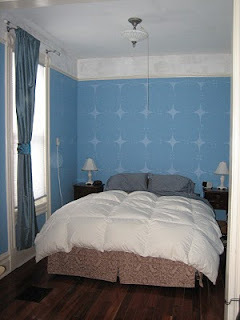 The contrasting blues were feminine yet not too girly. A few years back, we got an enormous deal on some hardwood flooring, so put that in, but then with the baby and life changes in general, things kind of ground to a halt. We just got back from the Macy's President's Day sale, where I got: 2 pairs of jeans, 1 pair of cords, a winter jacket, and 2 sweater dresses for $65 total, plus three $10 off certificates for a future visit. That said, it was hard work to track all of that stuff down — the racks were crowded, disorganized, and somewhat frumpy, and it was hard to get through the various departments to find things. Though I was excited to be getting things I really needed on sale, the experience was kind of awful. eta: I also don't know why the pdf of the menu is off center. But here's how to get tickets. Only a few left! Tonight we took Beatrix to the Winter Carnival Torchlight Parade. Lately she's been really into parades, and Clara took her to see the snow sculptures, so we were hoping she would have a good time — and we all did! We planned it so we would be at the beginning of the route in Lowertown. We found a great parking spot, remembered to graw a blanket from the back of my car to sit on, and had a perfect place just before the parade started. We stayed warm, and Beatrix got a ton of candy, beads, and other swag. Her favorite part? The princesses (and maybe the horses). Mine? The big trucks at the end that shot flame and warmed everyone up. This followed a lovely day of shopping at some smaller stores we love but never get to (Martin Patrick, Pacifier, Nadeau, the soon-to-be-departed-and-will-be-sadly-missed Wonderment, and Karma.) All in all, a great day!